Since early April, I’ve been running with intention, but the three weekly runs have served mainly as respite from what the yoga teacher training did to my calendar, starting in February. This week, I did my long run on a Monday morning (rather than the sensible time, of a weekend day), so I figure I must be officially training for a race. What I learned: running nearly 10 miles before breakfast guarantees a workday full of desire to do nothing but nap (yes, I did consume a few carbohydrates, before and during the run). So, that was my latest deviation from the suggested “intermediate” training plan for the Great River Ragnar Relay. I say latest because I’m deviating a lot, from that plan. This is because it’s insane. I’ve learned that running every day doesn’t work for me: my joints need the rest, and my brain and body need cross-training, and my life needs some time with friends and also with my yoga practice. Perhaps the Ragnar people posted such an insane plan, to get people to think about balance? 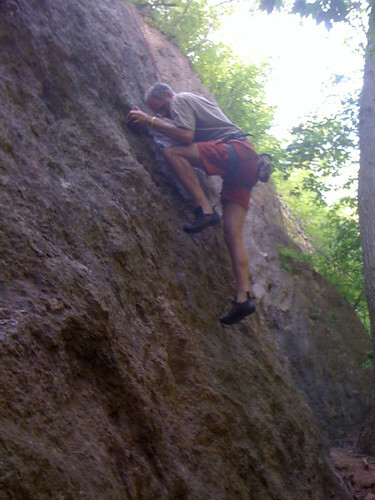 Segue to an explanation of the photo: my long run fell to Monday because I chose to go out for some rock climbing fun, on Sunday! In January, I did not renew my annual climbing gym membership. I figured, not having that to fall back on, in the summer, I’d get outside more. And, in order to make the yoga teacher training thing happen, something had to give, for a little while: the 6+ hours I spent each week at the gym, and the $300/yr membership. On Sunday, I realized how much I missed it! Oh, what fun. A friend at work recently asked me about climbing, and he assumed that I did it for the adrenaline rush. I told him, “Hell no!” I’m not particularly fond of adrenaline rushes, which may be surprising given my love of alpine skiing, snowboarding, and rugby. But the appeal of those is similar (aside from the rollercoaster “wheeee!” that skiing and snowboarding offer) to the appeal of climbing. No, what climbing does for me is provide streaming feedback on my performance. When you climb, you climb. You go up (or sideways: in any direction that isn’t walking on flat ground). With every inch that you move in some direction, you’re getting an affirmation that whatever you did, is contributing (or not) to your progress. Whatever you did, usually involves varying degrees of exertion, learned technique, and problem-solving skill. It’s not easy stuff; my personality craves the testing, taunting, and accolades. And, I love hanging out with my climbing buddies. I am so very grateful to have such great friends.